What a nice Christmas gift. I (My client and I) got the “Home Of The Year” award in the January Issue of San Diego Home/Garden. This was for our San Diego architectural photography. This typical 50’s single story Ranch was magically transformed into a 2-story Hamptons style home located in La Jolla, CA. This is a “Campout” image. I blend exposures from key time points over a 2+ hour period. My assignment was quite extensive, running three full days of shooting. Add to that, several days of post production. It was well worth it as it shows off everyone’s talents and won Home of the Year. There’s not much more that can be said. Seeing is believing. Here is a wonderful shot across the pool looking back to the house. This one causes lots of drooling. Can’t you see yourself enjoying the cool water at the end of the pool while watching your favorite game? Our process differs from many photographers. We are hired by, shoot and produce for the highest caliber of image usage. This usually translates to books, advertising and show submissions. Website and portfolio usage is obviously included. For contests in particular, it requires getting past the judges’ first and second rounds of elimination. This is where top notch photos will keep you in the running. Many worthy design projects have been discarded due to images being shoddy or “Good Enough”. I know, I have re shot several projects and they’ve won. We start with a preliminary inspection of the project where we shoot scouting photos. For this one we shot over 150 angles. We meet with the principles, in this case, IS Architecture . Then we narrow our shot list and determine the best time to shoot each image (i.e. morning, afternoon, night etc.). The number of images and their difficulty determines how many hours/days for the project. We also ascertain what props and styling will be required. While props are being gathered, we outline what additional lighting gel masking (color correction) and additional rigging/gear is needed. On the day of the shoot, we all converge and get to work. There is myself, the architect (principle), stylist, and assistant(s). Then we commence: Hard work, lots of fun, blah, blah, blah. After the shoot it’s my turn to personally handle the post production. I don’t farm this out. Since I was there and crafted the shots, I know what I want. No one else can. This can make or break an image and I believe it’s part of the creative process. Take a look at the rest of the images in our architectural photography gallery at Larny Mack Photography. You can also pick up a copy of the January edition of San Diego Home/Garden. The architect on this project is IS Architecture. OK, so I got my photo (my clients project) on the cover of Arts & Crafts Homes Magazine. After many years of garnering mag covers for my architectural photography, here’s the really cool part. THEY PAID ME. They are part of the publishing firm of Cruz Bay Publishing. In fact, these folks are growing and expanding. . I believe it’s because they have a basic respect for other creatives (writers, designers & photographers), like themselves. Here are a couple of the images from the featured article. You can see the entire project at Larny Mack photography. Normally when I’m working a San Diego industrial photography shoot, I feel generally ready to take on any task. Now I know I’m ready for any photographic situation. 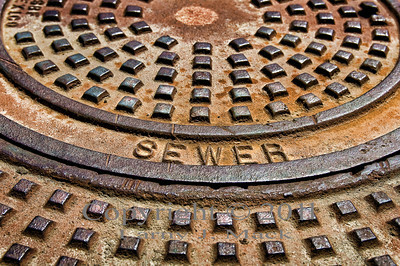 Still called a man-hole cover. I guess ERA didn't want to argue for equality on this one. Whenever I smell something bad I think of my mother. Don’t go postal on me; there is a back story to this. I’m the oldest of six children, so I spent the first twelve years of my life smelling dirty diapers, first my own (probably didn’t mind it), but then I was subjected to the innumerable contents of my remaining five siblings. Around the age of five I asked my mother, rather I demanded that we do something about the smell. She simply said “just turn your nose off.” Even at that tender age I figured she had gone round-the-bend. She explained how not to breathe through your nose but through your mouth. To a five-year old this was too cool, so off I went to practice. I do remember asking her to alert me to the next Number Two encounter so I could test my nose-less prowess. It took a while but I finally got it. WOW. No more bad smells. I could walk through a cornucopia of olfactory assaults without hesitation. By this time you have to be asking yourself, “What the bleep does this have to do with photography?” Well hang in there. Here it comes. I recently completed a contract with the City of Oceanside. 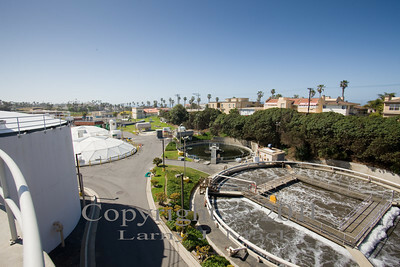 As commissioned by the Water Utilities Department, my charge was to document the City’s treatment plant. One of my specialties is industrial photography. These water facility plants process the clean or potable water but as one would suspect, they also handle the other end of the handle. It was really quite fascinating. The challenge was to bring visual interest to a process that most would just as soon flush and forget. I had my doubts and preconceptions going in but those were quickly shattered when I saw the ducks. 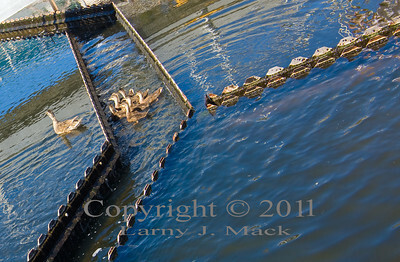 And who wouldn’t love the sight of ducks in a linear formation, especially a mamma duck and her brood of chicks. At any rate, the plant manager met me at the door and steered me toward a beautifully landscaped yard where three large pools of water were waiting dispersal. I hadn’t seen the ducks yet. He explained that this was the last step in the treatment process of sewage. These 100ft diameter pools housed the water that would ultimately be emptied into the ocean. Like many of you, I’m seriously reconsidering my next trip to the beach. But wait, who are these ducks? Swimming round & round & round is a family of water fowl. I’m guessing they couldn’t read the sign that said “Do Not Drink, non-potable water.” Who would know better what’s best for your children than momma? I’m also guessing the sign wasn’t there to really protect us from getting sick as much as protect our sensibilities. No, these ducks did not have three eyes, two bills, or an appendage growing out of their backs. On we trudged to the beginning of the process. This was called the scrubber and where I thought of my mother. The plant manager warned me and said most tours avoided this particular building. 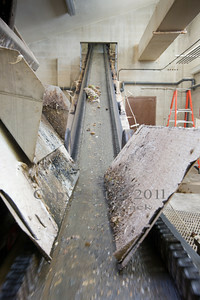 However, my job was to document the entire industrial photography project not just the pretty parts. So, off went my nose. Less than 6 steps inside, curiosity got the better of me. OMG!! !